The Recording Feature is available for an additional monthly fee, allowing sessions to be recorded by the session host. To request a quote to enable recording, or to disable recording on your account, please contact our Sales Team at (888) 200-7730, or [email protected] . 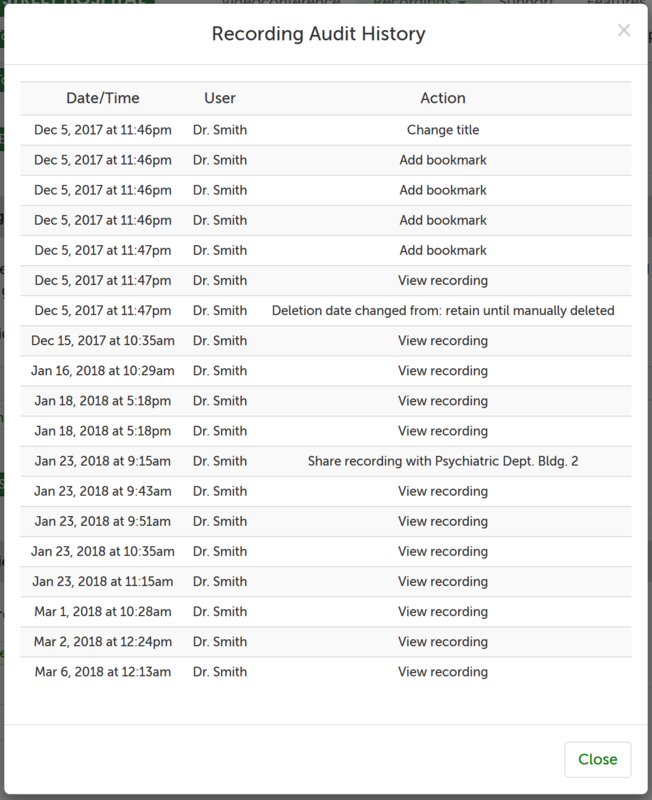 If you are an Account Administrator, Clinical Supervisor, or the owner of a recording (i.e., you scheduled the session that was recorded) with full permissions , this support article will show how to view audit history on a recording. 3. Click the "History" button at the bottom of the page. 4. Example of audit history; date/time, user who made the action, and what the action was. Add/Delete bookmark: user added or deleted a bookmark.